﻿ Cherry, Strawberry, Infantile & retinal Hemangioma: Causes, Removal with pictures. Skin Diseases > Hemangioma > Cherry, Strawberry, Infantile & retinal Hemangioma: Causes, Removal with pictures. 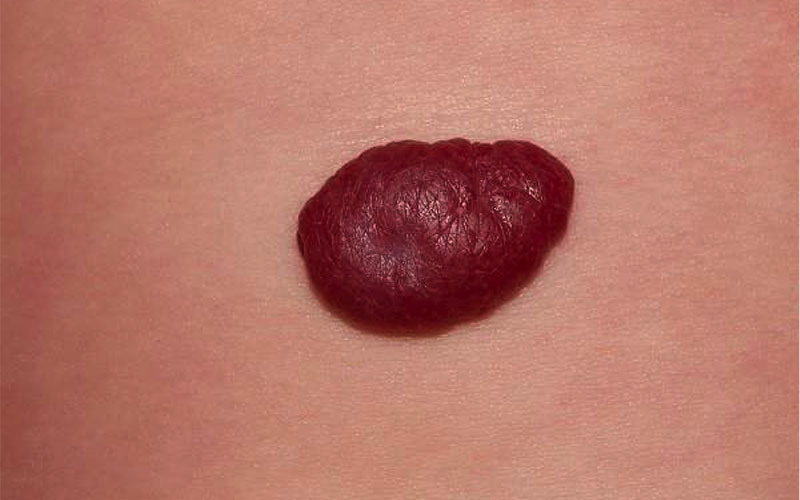 Hemangioma is typified by its colour – red – and to some extent, the shape. The dictionary explanation describes a contusion of blood vessels, malformed, creating a small lump or tumour, happily benign and non-cancerous. Hemangioma occurs on the skin’s surface or within the sub-layers. Hemangiomas are not always bulbous or blister shaped, they can be flat, extensive and relatively flush to the skin surface. In babies and young children, the old-fashioned term for them is commonly a strawberry birthmark. Infantile hemangiomas affect around five per cent of new births. They may look horrendous but in fact, fade and disappear within the early years of life. Affecting female new arrivals more than males statistically, they also demonstrate an increased occurrence in twins and babies which are not full term. Proud parents are often visibly shocked at the appearance of their new little treasure with a whopping great port wine stain. The trouble with Infantile Hemangioma is that it looks so ugly, highlighted in stark contrast against baby’s delicate porcelain white skin. Browse through these pictures and you understand the anguish and worry of any new parent in the delivery suite. Strawberry seems to be the colour of choice so what is a cherry hemangioma? 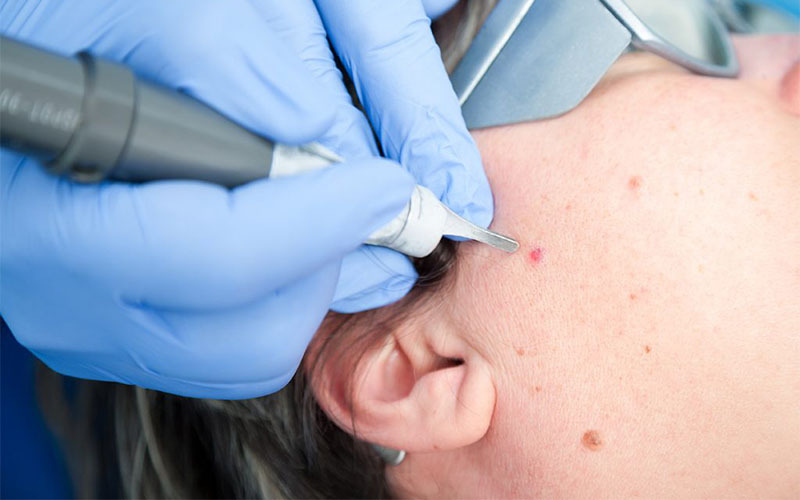 Sometimes also referred to as Cherry Angiomas, other names include senile angiomas or Campbell de Morgan spots, so called after the British surgeon who first identified them in the 19th century. Cherry hemangioma is a pimple or papule and may be small and isolated. The distinctive colour comes from the concentration of blood vessels, usually capillaries. Their shade can vary from bright red to a darker purple. Cherry angiomas are very common and easy to identify as they look like red moles although a skin specialist should always confirm the diagnosis. This term encompasses small spots or blisters but also refers to large areas on the baby’s body of angry, red tissue. Over 80% of strawberry hemangioma occurs on the face or neck, not always present at birth, they emerge in the first few weeks. There are two classifications of strawberry hemangioma, namely ‘deep’ for those far beneath the skin’s surface; these are usually a bluish red colour. The other class is ‘superficial’ a reflection of the fact they are on the skin’s surface. The latter are not usually raised in profile so flush and, are a vivid red. 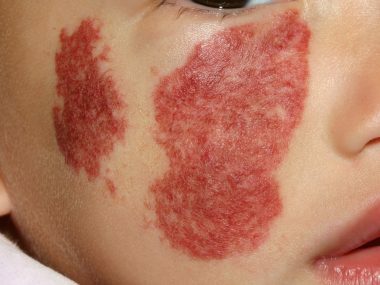 Hemangiomas continue to grow for between one and two years before then commencing a process called involution or regression. This procedure lasts up to a decade but it is likely intervention and removal will have been instigated years earlier. This promotes a better outcome and avoids a traumatic experience for the child during their school years. Parents or first timers dealing with a birthmark can take advantage of established networks of supportive information, scientific advice and guidance. The Birthmark Support Group signposts some really helpful websites, not all aimed at babies either. There is a veritable treasure trove of detail and shared experiences from people who have been in this exact situation. Birthmark.org will probably be top of your hit list, the Vascular Birthmarks Foundation. This is a huge repository of data covering all elements from treatment through to psychosocial and emotional issues for those with a birthmark and their loved ones. A visibly less than perfect child places huge stresses on the parents who inevitably will feel responsible in some way, searching for the justification or reason for the mark on their child. The mental impacts can be far-reaching, ironically not for the little one who doubtless has no awareness. Is treatment always a necessity in the case of retinal hemangioma? Any child with hemangioma will be assessed and monitored by a suitably qualified dermatologist to best understand the implications and appropriate treatment. For a retinal hemangioma, mechanical interference with the function of the eye and possible damage to delicate structures and lifelong vision means that early assessment is absolutely vital. Beneath the retina in the eye is a layer of blood vessels called the choroid, this is where the hemangioma sits. Because the retinal hemangioma is not cancerous, the primary concern is damage to the interior of the eye and disruption to sight. Incidence and prevalence are well documented but why certain children predispose to Hemangioma is not yet particularly well rationalised. There is deemed to be a genetic element but the research on this is no more advanced than the general advancement on inherited traits and is not specific to hemangioma. The focus currently is on the treatment and management of Infantile Hemangioma where it is present rather than a search for the causes. What options are there for removal? For cosmetic reasons, medics almost always intercede to treat hemangioma, there is a range of possible therapies at their disposal depending on the extent, depth and location. Although many hemangiomas resolve spontaneously, this can take years severely affecting the child’s quality of life in the interim. Below are some images showing successful treatments on children of varying ages.